Guaranteed you pass the exam and are 100% satisfied or your money back. A comprehensive 90-day reading curriculum covering 143 trauma topics, 2470 practice questions & daily key scientific articles. 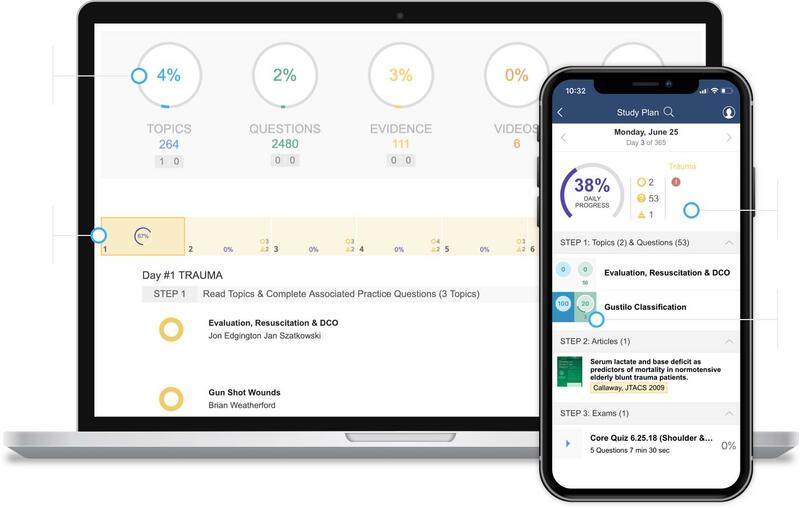 Integration with our new Peak Adaptive Learning Platform helps you learn more efficiently by tracking your progress and directing you to your areas of weaknes. The 2019 Trauma MOC 90-Day Study Plan is designed to prepare US Physicians for the 2019 ABOS Orthopaedic Trauma Practice-Profiled Recertification Examination, which is administered in August and September of 2019. The Study Plan can also be taken by any surgeons who want to reinforce their trauma knowledge and stay up-to-date on current trauma literature. We suggest starting before May 1st to finish before the ABOS exam window August 1st - September 30th, 2019. You will start receiving the daily emails the day AFTER you purchase. Alternatively you can complete the plan at your own pace using the adpative calendar. Think of each day as an individiual lesson that you can complete on your own schedule. Therefore, if needed, you could complete the 90 "Day" plan in less time. Detailed preferred responses description for every question that are kept Up-to-date by our authors. all premium content and features included with 12-month PEAK Subscription. 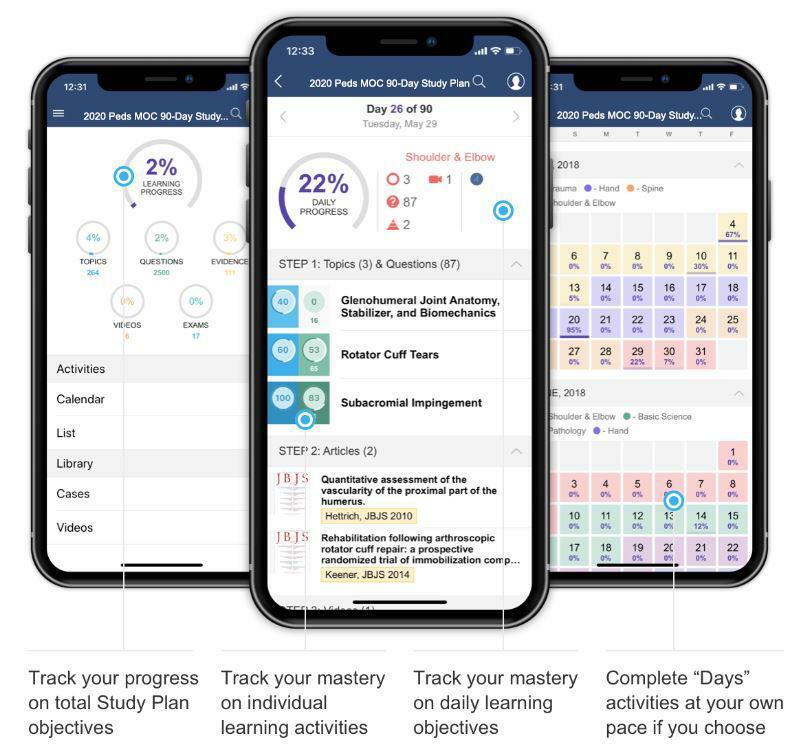 Gives you access to gives you access to the daily study plan, mock exams, and all premium content. Payment is made through PayPal and you automatically be redirected to your purchased product Orthobullets. Your login credentials on PayPal may be different than your login credentials on Orthobullets. - Be sure to log in with your usual Orthobullets email after you made a purchase with any email on paypal. - Example, if you use your spouses (or other) PayPal account when you are redirected to Orthobullets and asked to login in, log in with your usual Orthobullets credentials (even though the email is different than PayPal). You can confirm if your purchase was registered on Orthobullets by clicking "Purchased Products" in the user menu. If you have any problems email us at info@orthobullets with your Paypal transaction ID. If I lost some past daily Study Plan emails is there a way to get the old daily study plans? Yes. All past daily study plans can be found embedded in your Adaptive Calendar. Just select any day on the Adaptive Calendar to access the content for that day. What if I am a member of the group but am still not getting daily emails in my inbox? Check your spam folder and promotions folder on your email. Because Orthobullets sends high volumes of email, our email is sometimes filtered into spam folders or promotions folders. Be sure to look there for our emails. If that is the case, mark us as "not spam" and add info@orthobullets.com to your contact list to avoid this in the future. If you are still not getting emails, send us a message at info@othobullets.com and we will help resolve this issue. Click groups in the top menu, then click on Study Plans and select the plan you want to access from your list of joined study plans. If I bought another Study Plan, can I get this one? Our Study Plans work on a 12-month premium content model. Thus, you have access to all of our Study Plans during your 12-month subscription. If you have purchased another Study Plan, and would like to be added to this one send us a message at info@orthobullets.com. Note: if you only have 4 months remained on your 12-month subscription, you will only be able to obtain the first 4 months of this study plan. As a PASS subscriber you have access to this and all other study plans. Please send us an email if you are a PGY5 resident and would like to be switched from the Core Curriculum to this Study Plan at info@orthobullets.com. 1. Complete Daily Study Plans (spending on average 35 min/day). 2. Complete 16 module exams. Practicing orthopaedic surgeons preparing for the 2019 Trauma Maintenance of Certification Exam (MOC) administered by the American Board of Orthopaedic Surgeons. This internet enduring activity is designed to prepare surgeons in practice for the Orthopaedic Trauma Clinical Maintenance of Certification Exam administered by the American Board of Orthopaedic Surgeons. Through a review of 143 Orthopaedic Trauma topics, recent academic literature, and a rigorous mock examination schedule, the learner will be well prepared for the tested content and computerized format of the MOC. Upon completion of this activity, participants will be able to: Demonstrate an understanding of basic science, clinical presentation, evaluation, treatment options, and surgical techniques for Orthopaedic Trauma Topics.